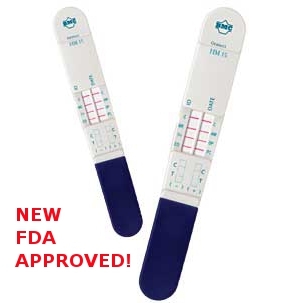 The NEW Oratect III Oral Fluid Drug Screen Device (Case of 25) is the first and only on-site saliva test to be FDA cleared. The Oratect device introduces a blue line indicator for the sufficient collection of saliva. Oratect Fluid Drug Screen Device simultaneously tests for 6 drugs, Marijuana(THC), Cocaine, Opiates, Amphetamine, Methamphetamine including MDMA (Ecstasy) and Phencyclidine (PCP). Oratect on-site saliva screen allows testers to obtain the rapid results they need without having the concerns of handling a urine specimen or having gender issues when testing the individual.